For wedding planning, Etsy was definitely a major contributor of ideas, inspiration and materials (like stickers for our favor boxes and invitations). But since planning, I hadn’t explored all of the vendors who do things other than wedding goodies. Now with our kitchen remodel, I am enjoying spending hours scouring Etsy for art for our kitchen, and admittedly, for other rooms in our house as well. Thanks to a couple very fancy readers, I have found several pieces that I LOVE! 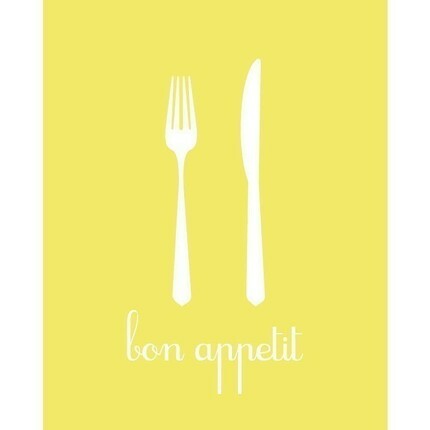 What do you think of the yellow bon appetit print from Lucky Bluebird Art? 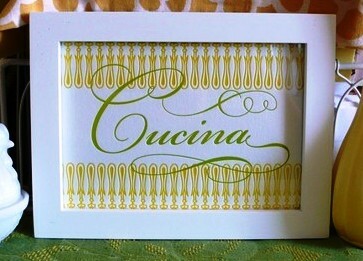 And thanks to HaiVy ,who writes a really fun blog that includes “design, style, commerce and culture,” I purchased this perfect letterpress “cucina” print from Hijirik Studio. I’m so in love. Now that I’m completely obsessed with remodels and Etsy art, please share your remodel photos or favorite Etsy art! E-mail me at livethefancylife@gmail.com. 3 Responses to "etsy art"
Can’t wait to see your new kitchen! Have a fancy birthday, Jessy! I just wanted to let you know that I am in love with your kitchen inspiration, and I may totally copy your ideas. We’ve been in our new house for almost a year and I have not touched the kitchen. After seeing your last few posts, I really think grey and yellow would look great with our blue/grey speck countertops! I am in love with your new Etsy purchase too! And thanks for the shout out – the idea that someone might read my blog will help keep me motivated.